The city’s William Street parking lot includes meters for 10-hour and handicap parking, as well as a fine box (on the right). 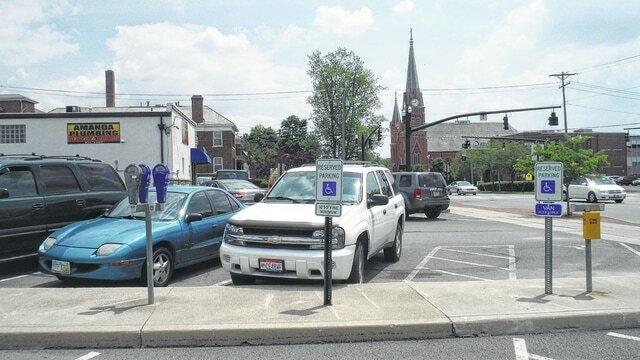 Delaware City Council will consider whether to change the city’s parking enforcement laws for the first time in nearly 25 years at its meeting tonight. The ordinance is in response to complaints that some people are parking at non-metered spaces on downtown streets longer than the current two-hour limit. A downtown parking committee led by City Council member Kent Shafer looked into the problem and made recommendations. “The group ultimately concluded that current fees and fines were insufficient to adequately change parking behaviors,” stated the committee’s parking survey. If passed, the ordinance would reduce the cost of some parking permits; increase parking ticket fines; allowing police to apply a “boot” to chronic offenders; and revises city code pertaining to stop signs. Monthly parking permits would cost $25, or $20 at the East William Street lot. Tickets would increase from the current $3 to $7 for over time if paid by midnight at a meter; from the current $5 to $10 for over time if not paid by midnight at a meter; from the current $10 to $40 for over the limit at two-hour parking; and from $15 to $25 for parking in a prohibited spot. In addition, if a vehicle has had three tickets in 30 days or five tickets in 60 days, ticket fees will be doubled; the $10 late fee for tickets more than 30 days old would increase to $20, with a $5 billing fee. The legislative summary noted that the police department issued 178 notices of non-payments within a 30-day period in May 2015; and 365 parking tickets of non-payments for three months or more were paid in municipal court in 2014. A boot will be applied to the wheel of a vehicle that has had multiple unpaid parking tickets. The boot would prevent the wheel from turning until the fines are paid. An additional fee would need to be paid to remove the boot. If the removal fee isn’t paid, the vehicle will be towed after two hours. Tampering with the boot would result in charges of criminal damaging or theft. The police department doesn’t currently have any boots, but would buy one or two. At a public hearing on May 11, one business owner proposed re-installing parking meters in the downtown area, with shops providing change for their customers. The summary said the 114 meters would cost an estimated $87,000. City attorney Darren Shulman said adding the meters would require separate legislation and wouldn’t prevent people from parking longer. The ordinance will have its third reading at today’s council meeting, and staff is recommending approval. The council meeting will take place at 7 p.m. in the second floor of City Hall, 1 S. Sandusky St. The meeting is open to the public.